Kettle corn, or kettle korn, is a favorite childhood snack, usually associated with the fair. It has a great salty and sweet flavor combination that is really irresistible. It's also really easy to make at home! 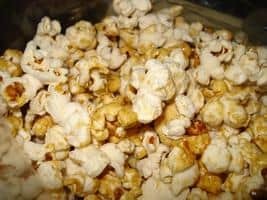 There are many different kettle corn recipes ranging from the traditional (salt and white sugar) to the complex (chipotle or maple kettle corn, anyone?). We've tried to collect a bunch of the different recipes so you'll have a variety of types to try. Most of the kettle corn recipes follow the same method. You heat oil in a large pot until it is at popping temperature. 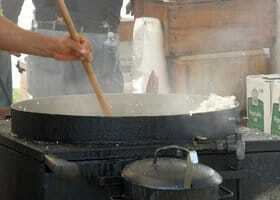 Then you add the popcorn kernels and the seasonings, cover the pot and cook the popcorn while shaking the pot. Once the kettle corn is done popping you pour it into a bowl, add any additional seasonings or garnishes, and enjoy! If you have any favorite kettle corn recipes just let us know! The is the most basic of the kettle corn recipes. It is basically just adding sugar to the normal pot-popping method. Most other kettle corn recipes are based off of this one.